You could throw your stuff away. We’re not a fan of trashing everything we worked so hard to get, but hey, you wouldn’t be the only ones to do it. In same fashion, you can shove everything in your attic or garage. 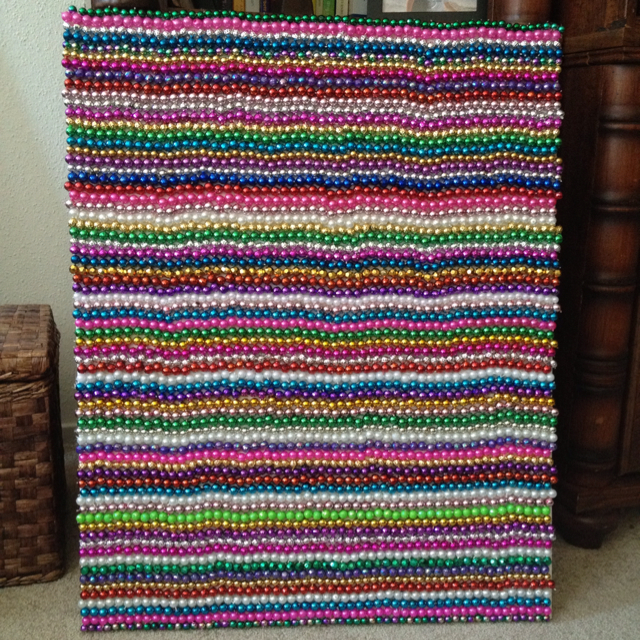 Buy recycled Mardi Gras beads and throws for less, and do your part to create “green” jobs for people with intellectual disabilities. 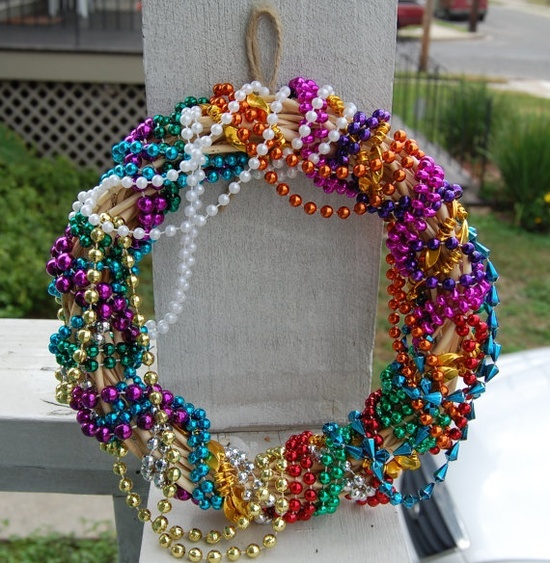 Join the Arc of GNO and the Sierra Club as we recycle Mardi Gras beads, trinkets, and stuffed animals for the 2013 Carnival Season, and keep them out of the landfills!! The group sells the beads to krewes. 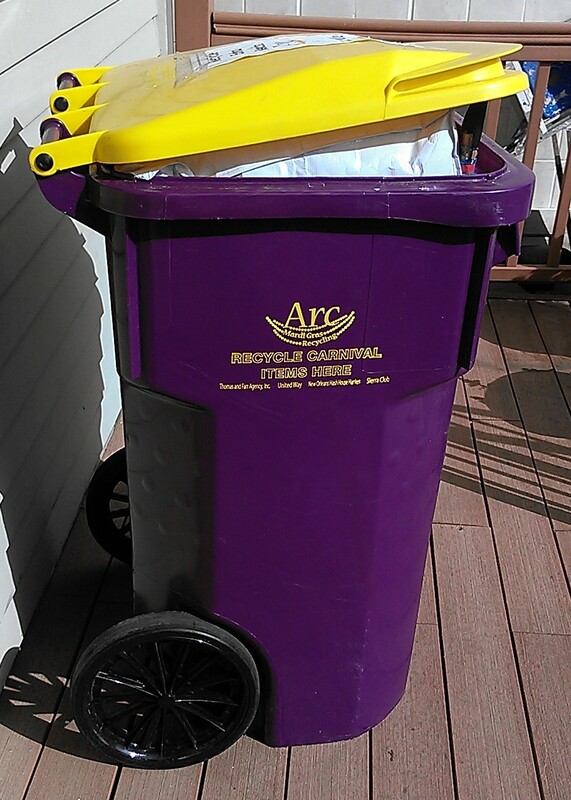 Several places around town have the purple & gold ARC recycling bins. Popular drop-off point – Whole Foods on Magazine Street (Arabella Station store). It’s to the right of the door in the parking area. We checked it out the other week and it was overflowing with goodies. 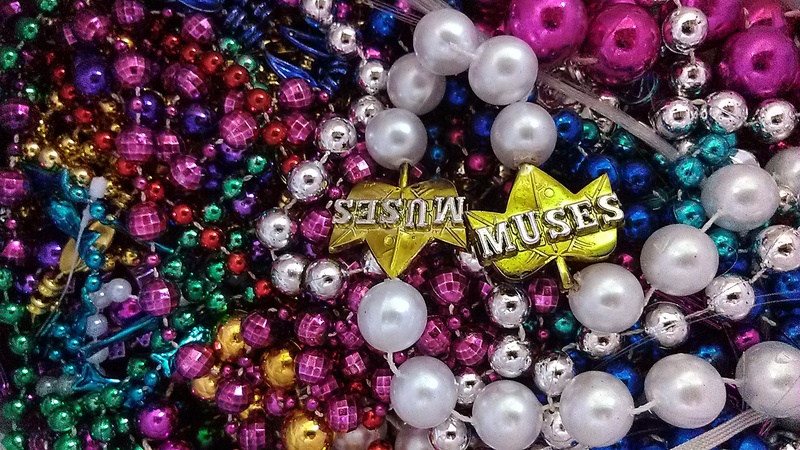 Muses bags, nice beads and plenty of throws. For a full list of collection points, call 504-837-5105. 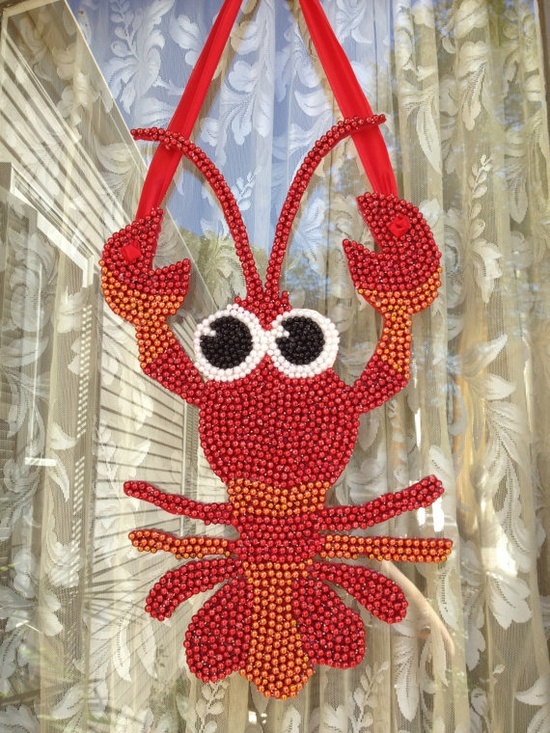 • Full list of 2015 bead drop-off locations in metro New Orleans. 3. Sell them on eBay. 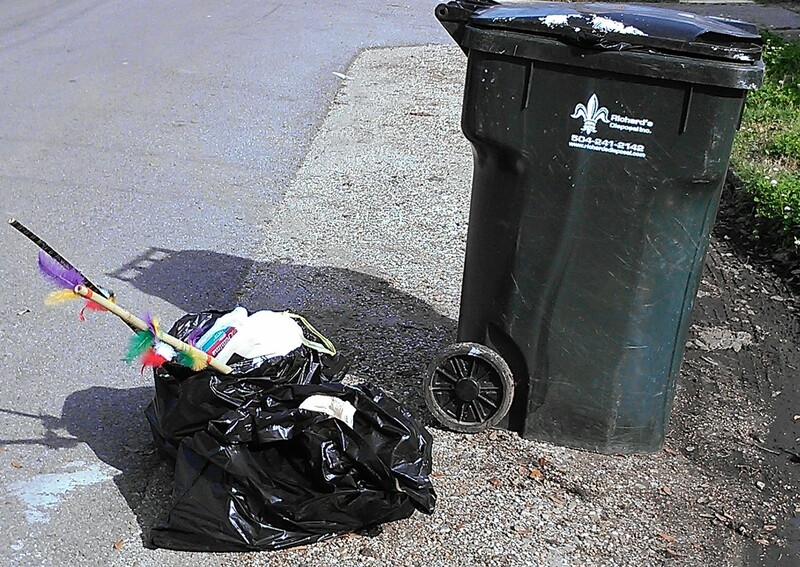 Some people choose to convert their free Mardi Gras goodies into cash. 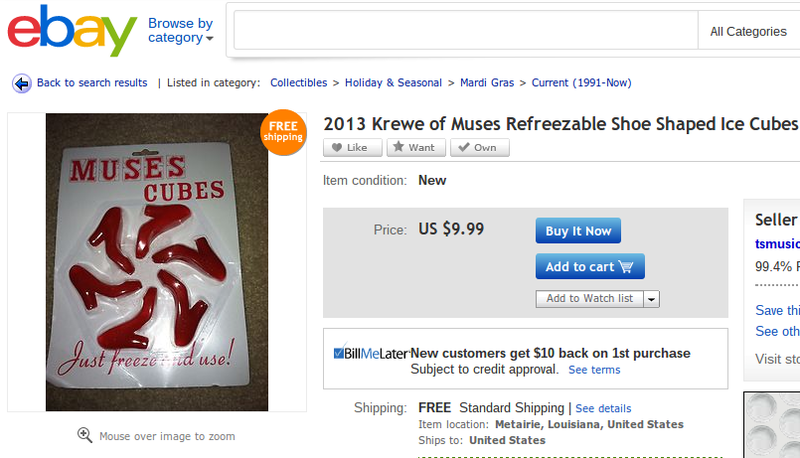 We checked eBay and found several throws from Muses listed. 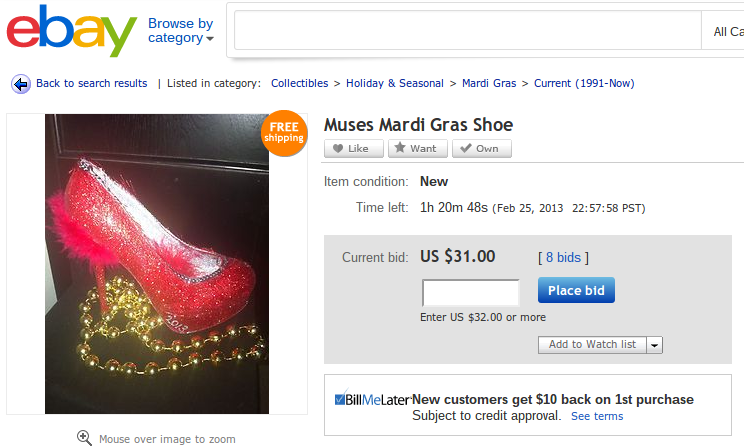 Really want a Muses shoe? Buy one on eBay. 4. 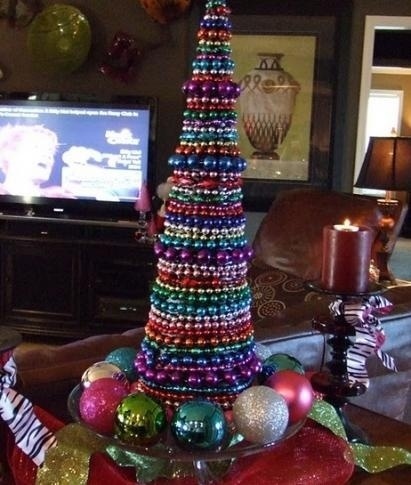 Make a bead tree. 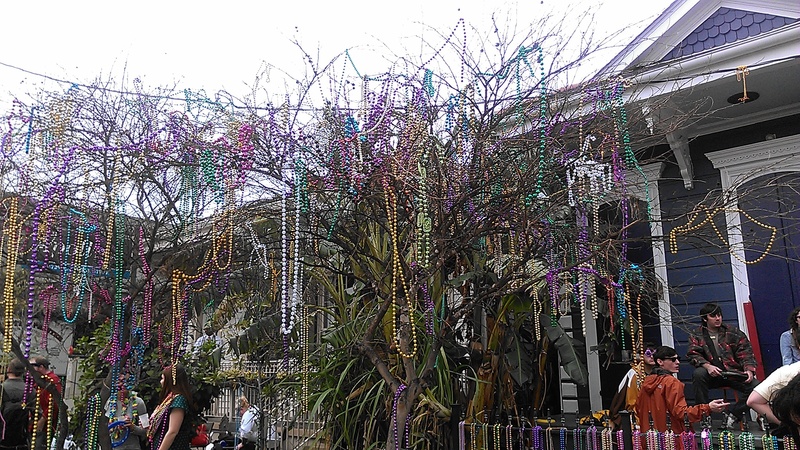 Throw your colorful beads onto tree branches. Some people (us!) love the look, while other people don’t. It’s up to you. You also can make a mini bead tree inside by filling an empty coffee can with foam or sand and sticking a bare branch in the center. 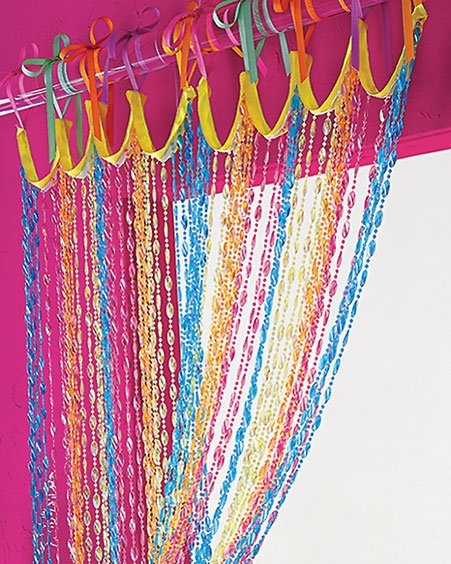 Decorate the branch with beads. 5. 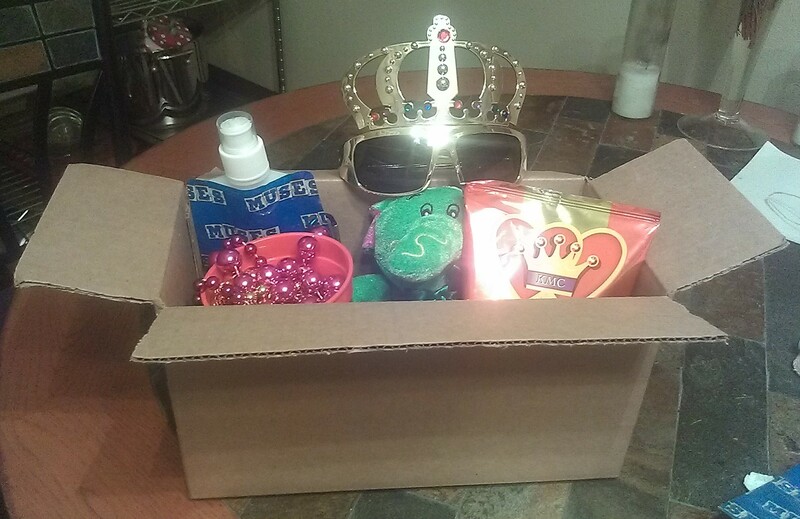 Mail out Mardi Gras care packages. 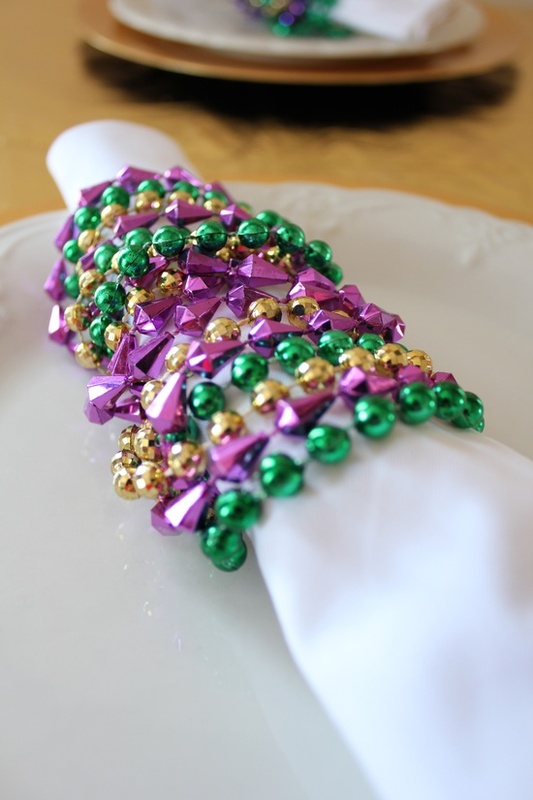 Mardi Gras care packages are perfect for your out-of-state family and friends. They also are good for your New Orleans friends who have moved away. 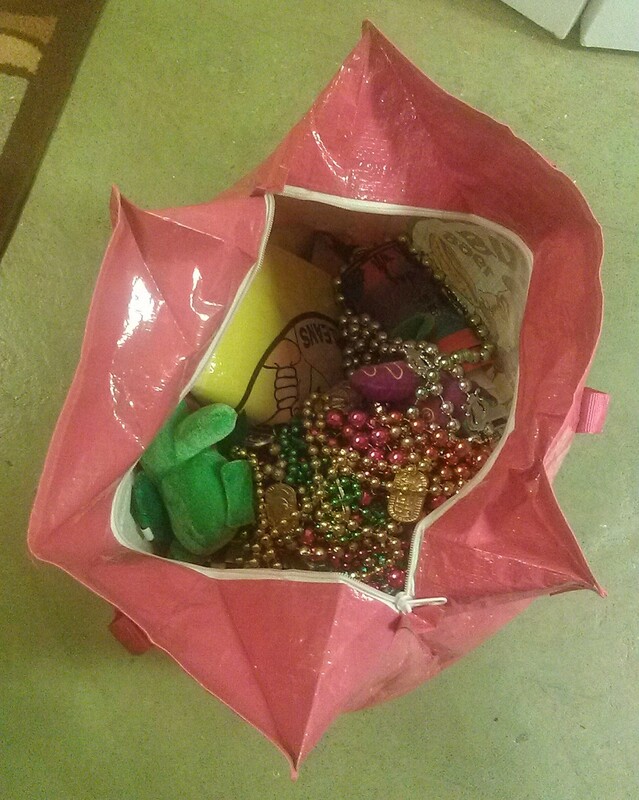 We filled our boxes with beads, cups, chips, doubloons, plush toys and note. These are good to mail after Mardi Gras, or if you want to store them for a year, you can mail them before Mardi Gras next year. We love this idea from Pinterest. 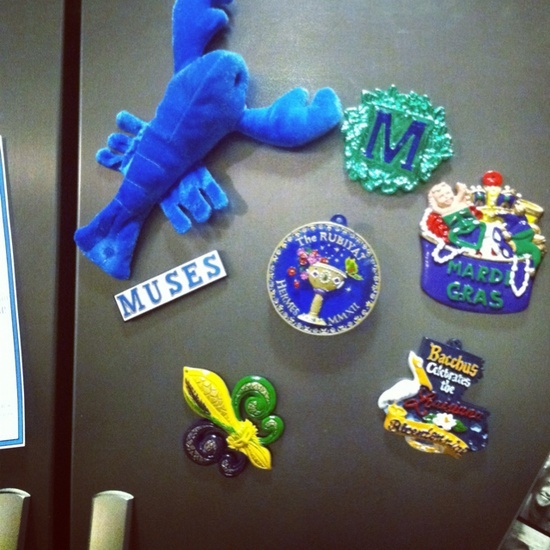 Remember your Mardi Gras adventures every day with magnets on your fridge. 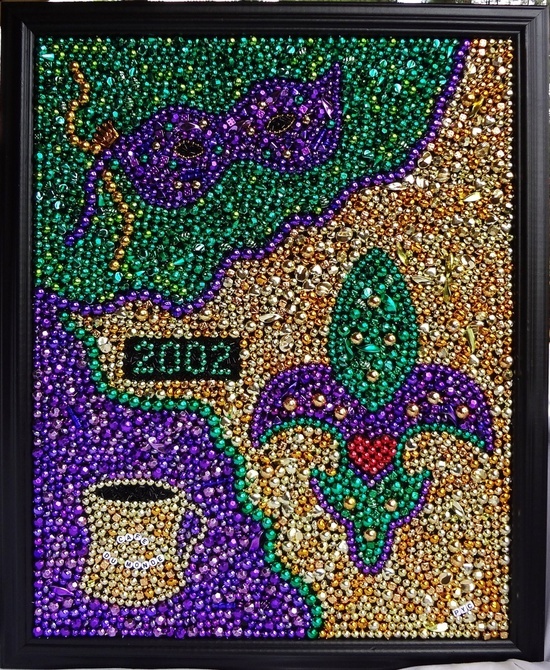 Snip the krewe medallions off the beads and hot glue magnets to the back. 7. 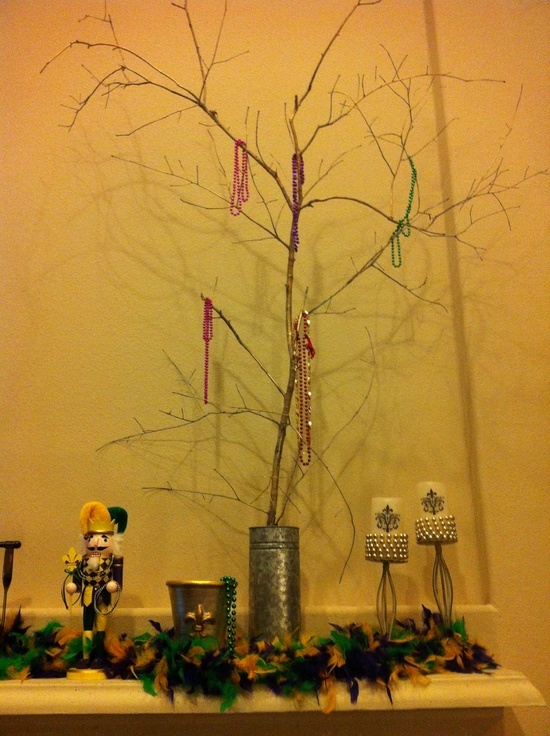 Make a Mardi Gras tree. 8. 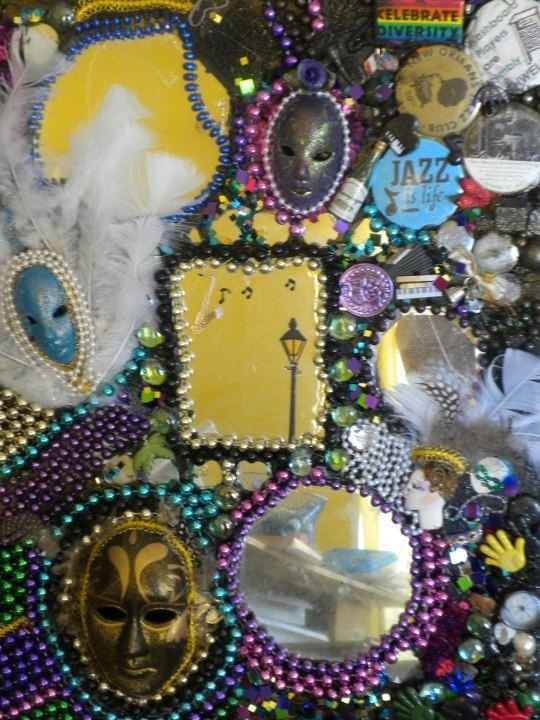 Create a Mardi Gras mosaic. 10. 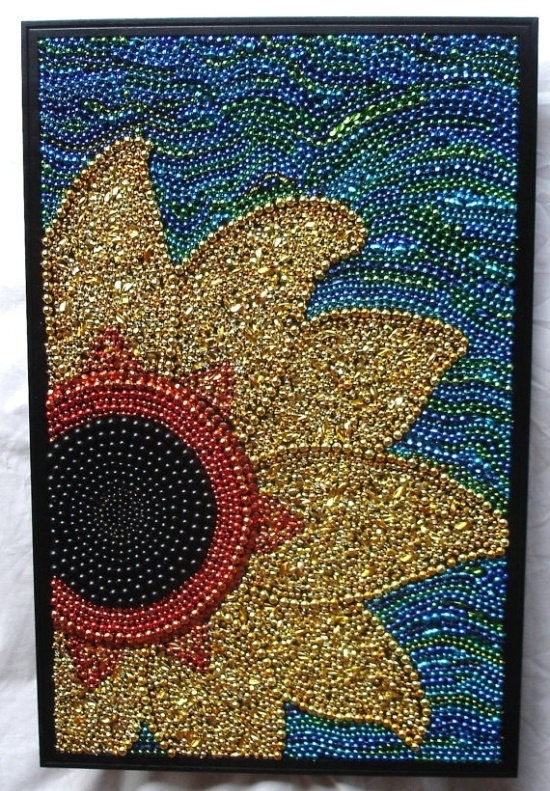 Make a piece of art for your wall or door. 11. Use them in gift-wrapping. 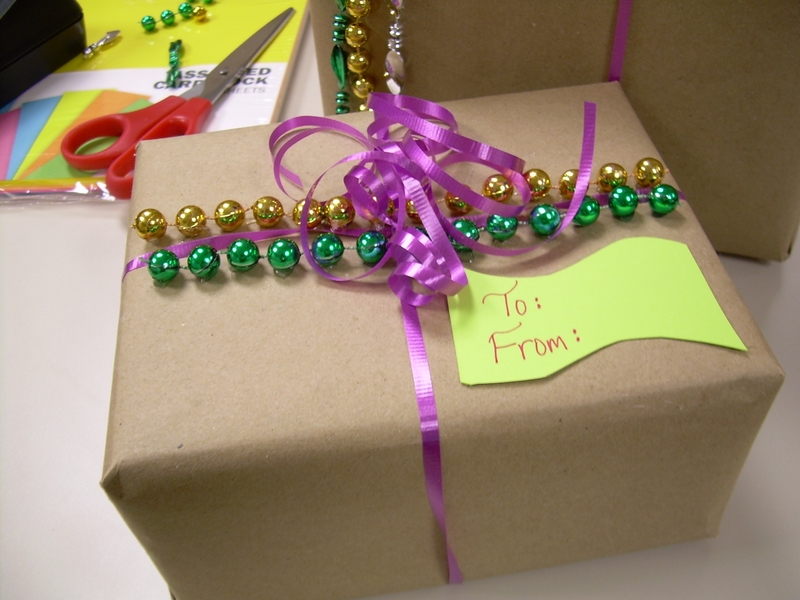 FedEx’s blog has a how-to guide for using Mardi Gras beads to decorate boxes. Read it here. 12. 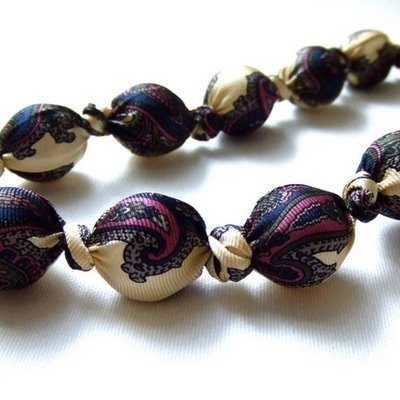 Upcycle them into jewelry. 13. Give them to house guests. 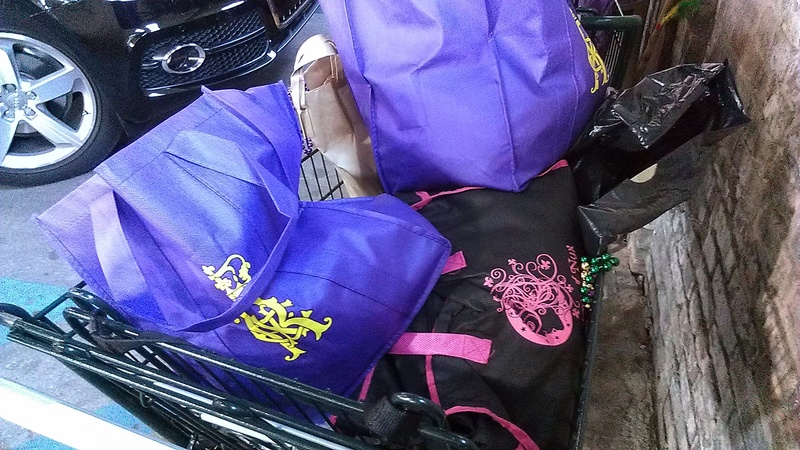 We keep a Mardi Gras swag bag in our house. 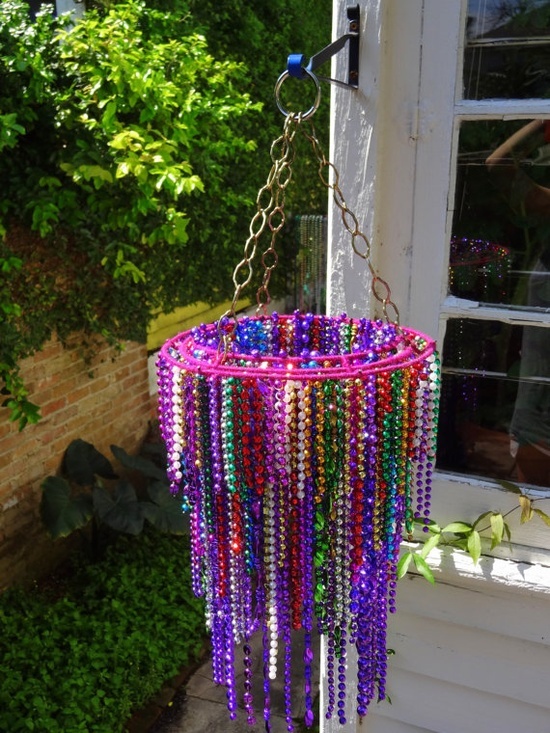 It’s full of beads, cups and plush Mardi Gras throws. When out-of-town visitors stay with us, they are welcome to grab some goodies out of the bag. It’s a nice way to get our guests into the New Orleans spirit, plus we get rid of the extra items. 14. Put them in your costume trunk. 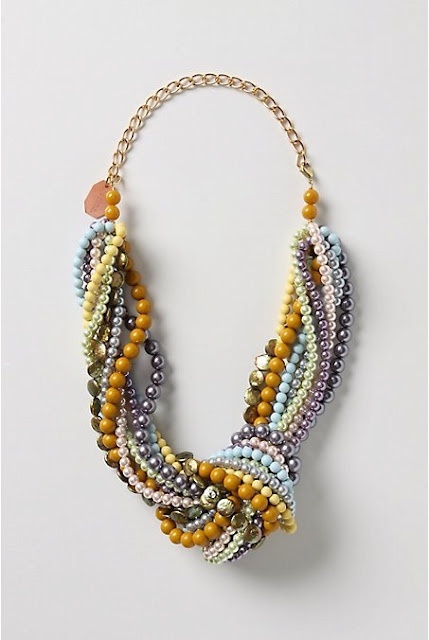 Beads always come in handy. You can reuse them for holidays – St. Patrick’s Day, hello?! – and they make good costume accessories for you and for the kiddos. 15. 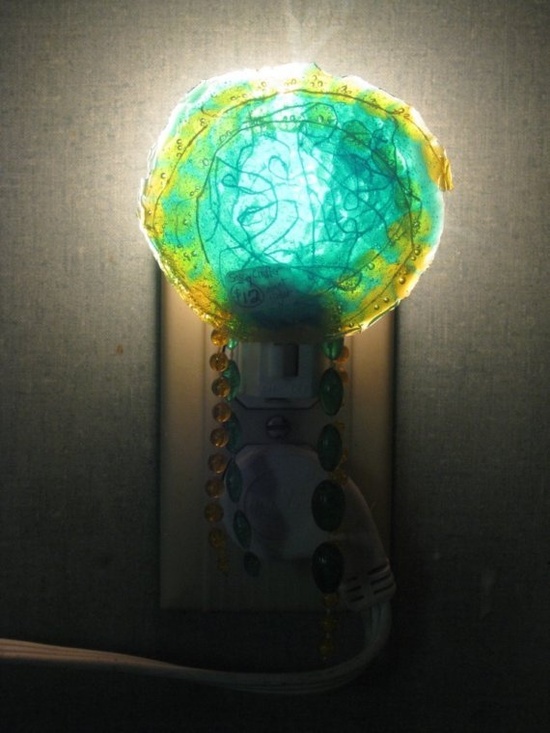 Make a nightlight or lamp shades. 16. Use them as dog/cat toys. Our cat likes to play with the plush toys. 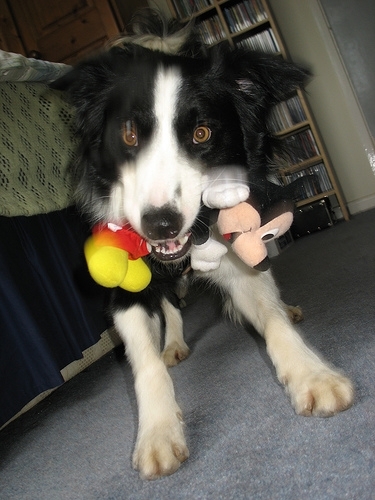 We’ve seen dogs playing with the throws, too. 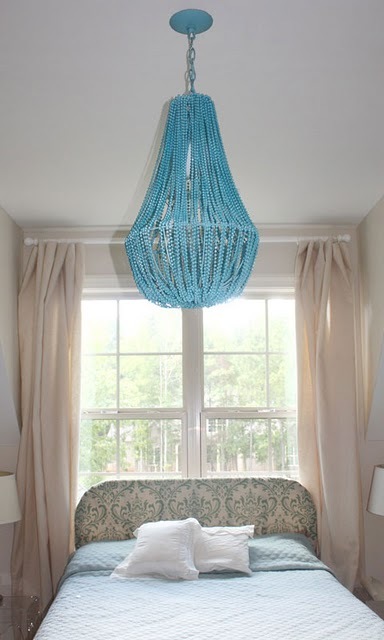 Here’s the step-by-step instructions for the chandelier. 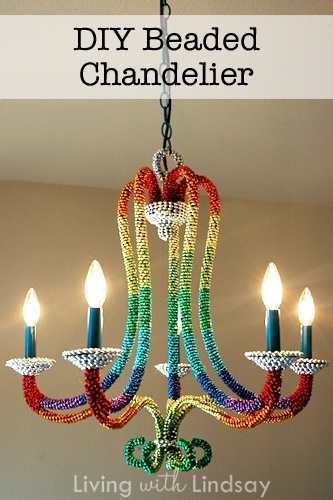 Want to jazz up your existing chandelier? Makelyhome.com has instructions for that. 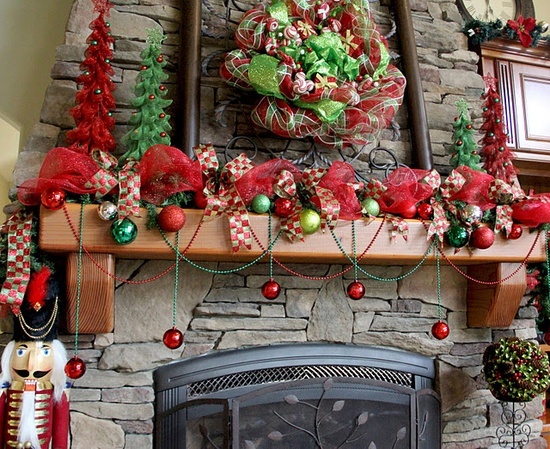 This wreath is for sale on Etsy for $75. It’s in @nolabeadart’s shop. NOLAbeadart on Etsy made the second wreath. 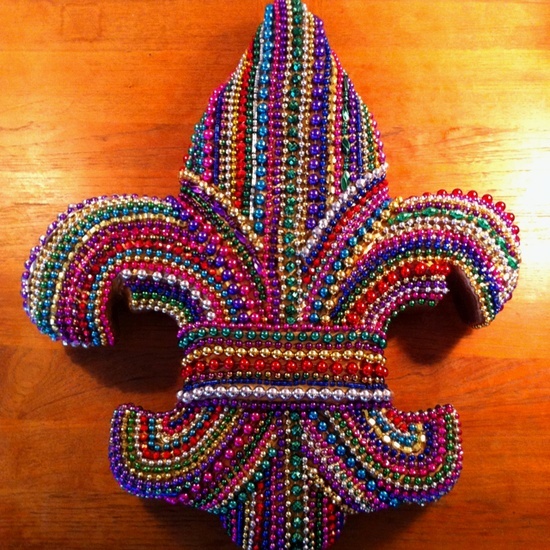 The seller has several other Mardi Gras bead crafts for sale. See the store here. 20. 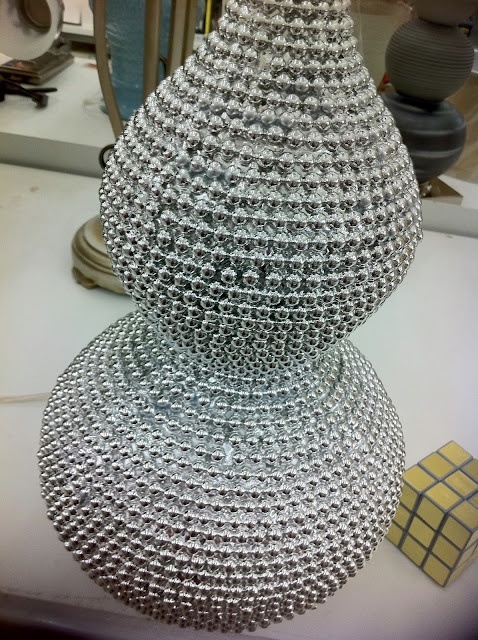 Bedazzle lamps, glasses, skirts, napkins, etc. 21. 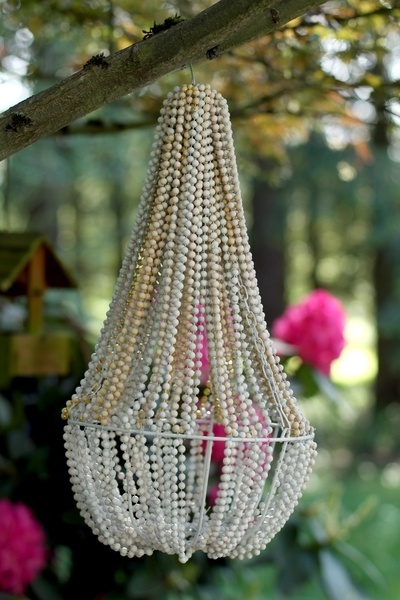 Decorate a fence or a staircase. Don’t let your house/apartment/condo be naked during carnival season. 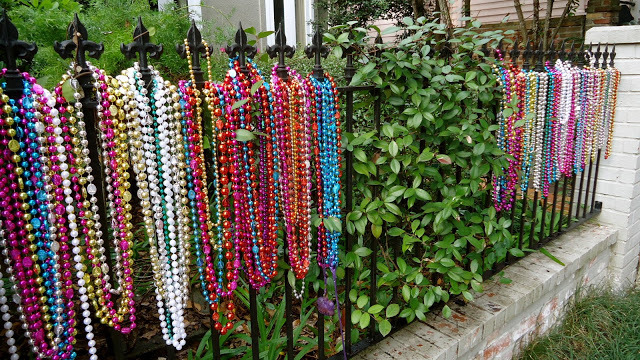 If you have a fence, it needs beads. 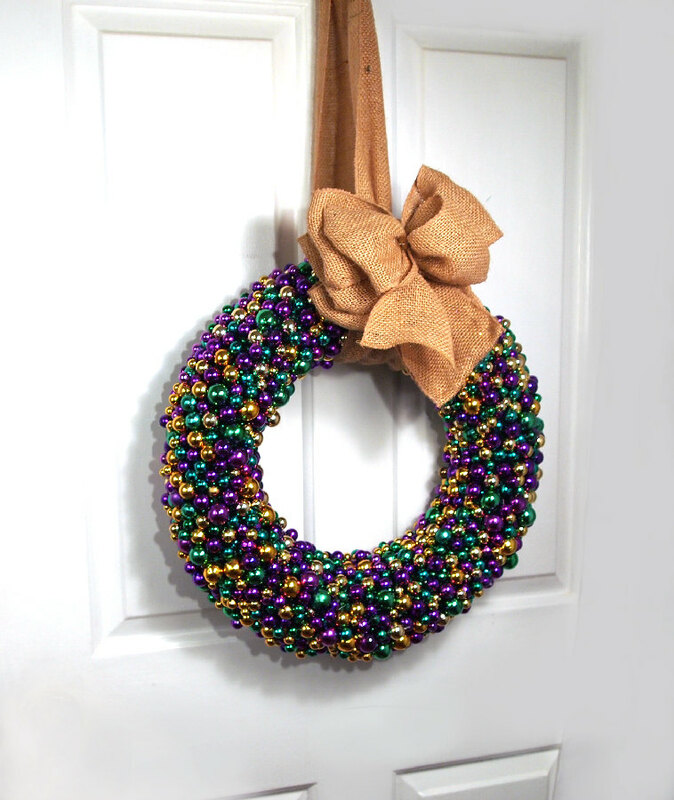 The Visual Vamp blog has several other good ideas for Mardi Gras home decor. Check them out. 23. 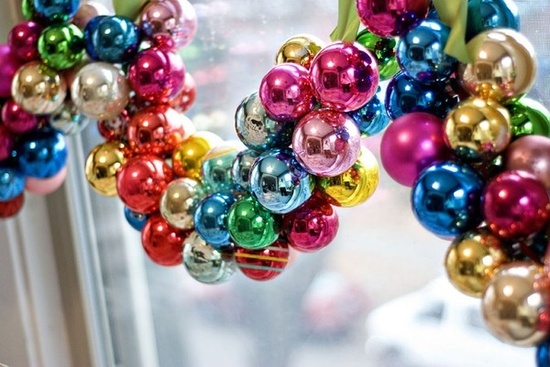 Use them as Christmas decorations and ornaments. 24. Join a krewe and throw them to paradegoers next year. We’ve pinned several more ideas and examples on Pinterest. Check them out. 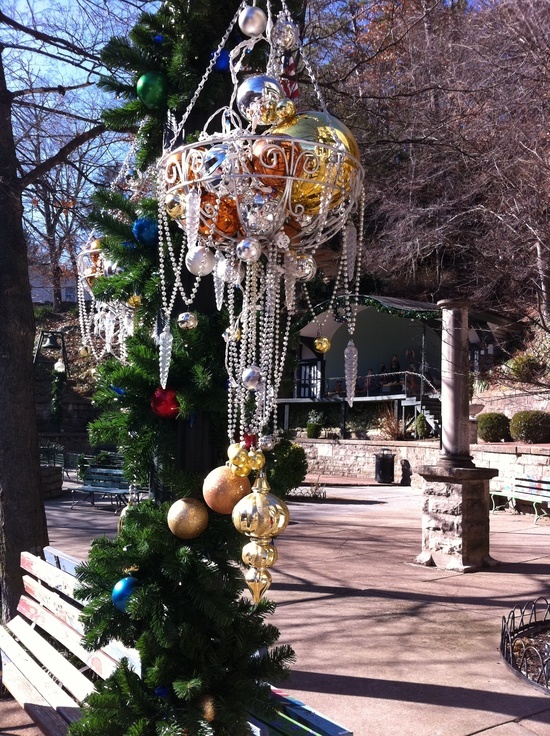 I like bead trees too. So many gorgeous ones all over the city. Have you been to Mardi Gras in New Orleans? This is what I did! 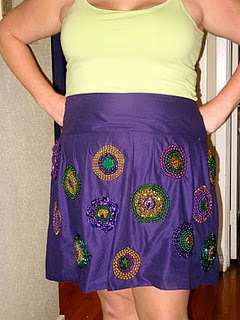 Thanks for featuring my store on your post http://nolabeadart.etsy.com ! This a very detailed post. Good job! You have cool projects for sale, Katie. Thanks for checking out NewinNOLA.com. 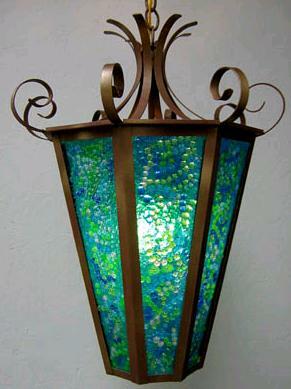 I’m looking for info where I saw a craft using madea gras beads ,baked the beads into a lamp shade.,Has anyone saw that.? I need them. Can you email me?